Nail Art: Playing With "I'm Not Lion"
It has been almost 2 weeks of nonstop rain with strong winds here in Manila and I've been down with a slight fever and a bad cold for a few days now. It has been keeping me away from doing one of the things I love -- nail art. But a couple of days ago, I changed the polish of Nanay (English: mother) and decided to wear the same thing! We both wore China Glaze I'm Not Lion. It was part of a recent haul I got from Digital Traincase, for which I am very thankful for bringing in recent polish collections here in our country. I am not really fond of glitter polishes because I hate removing it. But when I saw this in the Safari Collection, I instantly knew that Nanay would love it and it didn't disappoint! 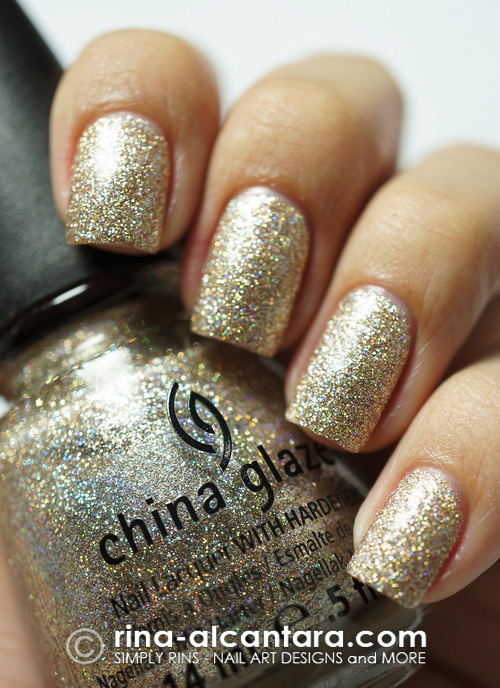 This is one glittered polish I love. I wanted to add some design after a day of wearing I'm Not Lion. The problem with glittered polishes is that nail designs would have a hard time popping out and I thought it would be a shame to cover the sparks of this beautiful polish. But I really wanted to add something to my manicure and I thought that black would be a good contrast. I decided on a simple sponged black tips. Do you think the tips made this mani a little scary to look at? I thought so, in a way. But overall, I still liked the idea. I wonder if a different color for the tip would look better. On top of my head is a very light yellow. If you're looking for a quick idea on how to wear your nails for a formal event, I recommend this nail polish. It's elegant and classy by itself. Do you own a bottle of I'm Not Lion? What are your thoughts? how did you do the sponge tips? what kind o f sponge you used?